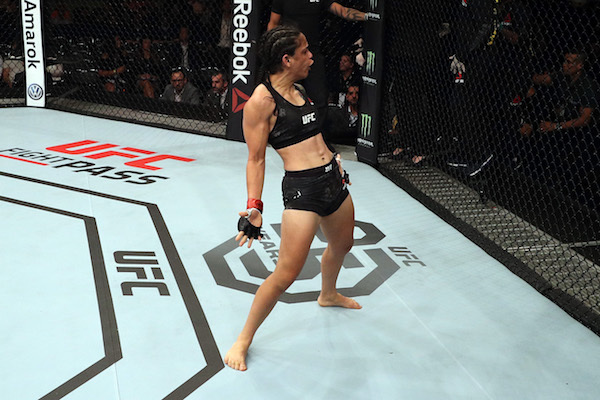 Livia Renata Souza, 12-1, made her UFC debut short and sweet with an 81-second submission victory over veteran Alex Chambers, and now she’s calling for heads. In Souza’s Invicta FC debut in 2015, the 27-year-old introduced herself to the division by winning the Invicta FC Strawweight Championship, earning Performance of the Night honors and pushing her record to 8-0. Eight months later, she earned a second consecutive Performance of the Night bonus while defending her title. After Souza lost her title to Angela Hill by decision, she bounced back with three straight wins. Clearly, adjusting to fighting in America came easy. However, the new language and culture was a difficult hurdle, but not for long. While some fighters getting their big break are thinking about cars, houses and jewelry, Souza is thinking about how to improve her English her own unique way. “Well I learned English from listening to some rap songs and and playing video games,” Souza said. “I needed to pass the levels and keep improving my English to play. Thanks to her own unique way of learning, Souza now participates in fully English interviews just three years into living in the United States, and “The Brazilian Gangsta” is very clearly calling fighters out by name with no regard for the potential impact on her. With a solid foundation and youth on her side, Souza is in a good position to take the division at will. 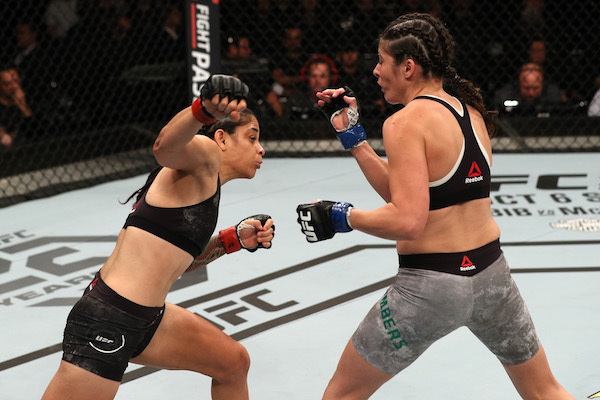 Sights are set on Aguilar if it works out, and Souza welcomes any opponent, but there will always be a burning spot inside The Brazilian Gangsta for one fighter in particular, and the message to Angela Hill is loud and clear.